This page outlines the origins, emigration, and life of the DIDIERs, but while researching, I found so many nice old maps. I have not listed their many descendents, because the information is preliminary, but please help if you have any information to share. Pierre DIDIER was born 3 Nov 1765 in Wolkrange and moved to Calmus. His parents were Peter DIDIER and Maria DICKES. There were other Didiers living there too. He married Anna Maria Feller, born 8 Apr 1771 in Calmus, and died 31 Jan 1832 in Calmus. Buvange and the entire Arlon area were part of Luxembourg until the 1830 Treaty of London, when about half of Luxembourg was given to Belgium, although the transition took until 1839. It's now known as the Luxembourg Province of Belgium. Calmus and Beckerich remained part of the Grand Duchy of Luxembourg. Map showing Udange, Wolkrange, and Arlon in Belgium, and Beckerich and Calmus in Luxembourg. The gray vertical line is the national border. Buvange is too close to Wolkrange to show here. Martin DIDIER was born 6 Jun 1799 in Calmus, Luxembourg. He died 20 or 28 Jun 1842. He married Maria PETERS, born 1 May 1808 in Beckerich, and died 9 Aug 1867 in Beckerich. They had 10 children. Some of their sons emigrated to the US. The four DIDIER brothers came from Beckerich, Luxembourg, and settled on farms in South Evanston, Illinois, between the present location of Howard St. and Mulford St., and between Asbury Ave. and Dodge Ave. They all had large families. Johann "John" DIDIER 19 Mar 1826- 28 Jul 1903 m Susanne KETTEL 27 Sep 1824- 11 Dec 1890. Susanna came from a family of millers in Buvange. Johann and Susanne ran the mill in 1857, taking over from her father and brother. Their children were born in Belgium. Jean-Nicholas "Nick" DIDIER was born 18 Nov 1828 in Beckerich and died 5 Feb 1893 in Chicago. He studied the Classics at the university in Trier, until he gave it up in 1848 because of revolutionären Wirren (revolutionary confusion). He emigrated in 1854 to Evanston and m Martha Marie LARSON (1835 - 1870) who was Norwegian. Nick was a founding member of St. Henry's Parish in Rose Hill, and later one of the founders of St. Nicholas Church in Evanston. He was also a trustee of the Village of South Evanston. After the death of Martha LARSON, Nick went back to Beckerich and married Elizabeth REDING on 14 March 1871, and they returned to Evanston. Michel "Mike" DIDIER was born 26 Mar 1837 in Beckerich and died 05 Jan 1920 in Evanston, IL. He married Margaret KETTEL, Susanne's sister. They emigrated on 31 Mar 1859 aboard the Hammonia. Margaret was born 7 December 1839, and died in Evanston 08 Nov 1875 after a 2 month illness. They owned 30 acres of land in 1861, along what is now Howard Street. After she died, Michael married Margaretha Grotz on 02 Jan 1877 in Cook County IL. She was born 11 Jul 1843, immigrated in 1870, and died about 1907. It's said he lost his farm. By 1884 he is listed at different places but still working as a farmer or gardener. The land ownership maps seem to show something out of the ordinary. In 1910 Mike is a widower living with his daughter and son-in-law, the Papes. Jean-Pierre "Peter" DIDIER, b. March 1830 in Beckerich, and his wife Marie had a farm in Evanston as of 1870, but moved on to Iowa. He died in 1873. They also do not appear on the maps below. There was another Pierre who was their cousin. Susanne and Margaretha's parents were Pierre KETTEL and Margaretha HEMMER. They ran the mill at Udange, Belgium. Peter DIDIER is buried in Iowa. John and Michael DIDIER and their four wives are all buried in St Henry's Church in Chicago. The Didiers all had very large families and there are many variations of family trees to be found, often containing errors. The entire NE quarter of section 25 was purchased as a land grant by Edward A Mulford on March 10, 1843. There must have been a big land sale on that date. The table below shows certain original sales of lands from the Federal Government. Diagram of sections in a typical township. An ideal township is a six-mile square of 36 sections, each section of land being one square mile, 640 acres. The nothern line of Section 25 is now known as Oakton Ave; the southern line is now Touhy Avenue. The center line is now Howard Street, which divides the City of Chicago from the City of Evanston. The east line is called Western Ave in Chicago, and Asbury in Evanston. The center line is called California Ave in Chicago, and Dodge in Evanston. The west line is now called Channel Rd, and sits where Kedzie Ave would be if it were extended. 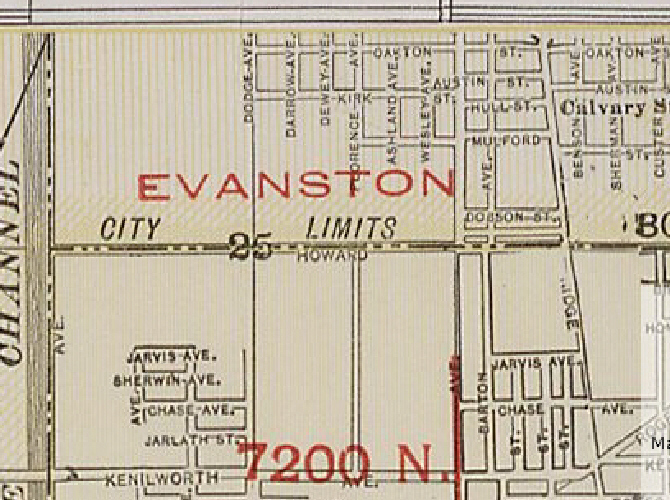 This series of maps focuses on Section 25 of Evanston Township, Cook County, Illinois. They also include the western half of Section 30 of fractional T 41N, R 14E, up to Ridge Avenue. Evanston Township was formerly known as Ridgeville Township. Separate Plats of Sections 25 and 30 from an 1840 map. The diagonal "Indian Boundary Line" was negotiated in the 1816 Treaty of St. Louis between the United States and the Potawatomi Nation. It was the north boundary of a strip of land from Lake Michigan to the Illinois River, giving the United States the Chicago Portage for trade purposes. It was the link between the Great Lakes and the Mississippi River system. The Americans were already envisioning a canal between the two waterways, and the Potawatomi Nation accepted the loss of that land in exchange for peace in the remainder of their territory. This treaty line, shown on all the maps below, is now the location of Rogers Avenue. The US honored its treaty for just 18 years, and in 1834 the Indians were forced to give up the rest of their land, and were relocated to Iowa. This map is from http://landplats.ilsos.net/FTP_Illinois.html, selected from hundreds of original Illinois township plats. On the 1851 map, the 25 on the map marks the center of the section. No DIDIERs had arrived yet; in fact the area was populated only by Mulford, Phillips, and Marshall. The double line indicates the trail that is now Ridge Avenue. Closeup of 1861 plat of South Evanston showing property of N Didier and M Didier. Acreage and locations of buildings are shown. South Line of M Didier land is now Howard St. North line of N Didier land is now Mulford St. East Line of both is now Asbury St (called Western Ave in Chicago.) West line of both is now Dodge Ave (called California St in Chicago.) North line of "Heirs of EA Mulford" land is now Oakton St. The original ditch site became a railroad line by 1890. The North Shore Channel Project, constructed between 1907 and 1909, straightened and deepened the ditch to below the level of Lake Michigan. It was extended southward to the Chicago River. With its direction reversed, the canal now carries fresh lake water southward into the Chicago River system. In contrast Ridge Ave. was a glacial moraine. Everything west of Wesley was originally forest land. (See green line on 1840 map.) During high-water times only Ridge Ave and Chicago Ave to the east (Clark Street in Chicago) were passable. On the 1886 map Nicholas' 44 acres have not changed. But Mike's new 20 acre parcel has been divided, the 5 acres along Howard Street going to J Deider (that must be Johann DIDIER) and the 15 acres above it to Snydacker. In Mike's original 30 acres, the west 22 acre piece now shows two names: Snydacker and M Dieder. I don't know what it means for two names to be on one parcel. And I don't know who Snydacker was. I believe he was connected to Northwestern University. And Mike's eastern 8 acres now bear the name N Brill. Nicholas Brill was the father-in-law of Andreas Fuertsch, whose brother Joseph married Mike's daughter Mary Didier. Andreas had married Mary Brill in 1872. That could be how Fuertsch acquired the farm. I was surprised to see Brill's name on it all the way until 1898. Later Andreas' son Lorenz Fuertsch continued farming the land. On the 1890 map, the situation was still the same, but this map is clearer. The diagonal line at top left is a railroad line. 1898 map. Situation still unchanged. Mike Didier's name still appears along with Snydacker, but at some point he lost the farm. Streets were often constructed along property lines. At least in the 1896, 1898, and 1901 city directories, Howard Street was known as Didier Avenue. 1921 map. This is from a 1921 Cram map showing how some of the streets filled in. Touhy Avenue was then called Kenilworth Ave.
2008 map A showing streets today, with Section 25 outlined. 2008 map B. Notice on what was formarly Nick's farm, the electric railroad built in the 1920s (The "Electroliner," later the "Skokie Swift," now the CTA Yellow Line.) This view also shows the North Shore Channel running north-south along McCormick Blvd. J.P. DIDIER born in Beckerich, buried 8 Jul 1873 in Caledonia, MN, 44 years old, hence born about 1839. He had only lived there a short time. He was the proprietor of the "Luxemburger Heimath," a German language newspaper in Brownsville, Houston Co, MN. JP was likely the son of Michel. There are still Kettel families in the Arlon area of eastern Belgium today. There was a Mathias Kettel who arrived in New York 12 August 1833 with his father Peter Kettel (born 16 october 1796 at Habergy), his mother Marie Françoise Biloque (b. 18 December 1794 at Meix le Tige, Luxembourg, now Luxembourg Province, Belgium), and his sister Catherine Kettel (b. 23 July 1819 at Habergy). Mathias and his family went to Stark County, Ohio and about 1848 moved to Scott County, Missouri. Two sisters died before the family emigrated to the USA: Mari Catherina Kettel, born 19 July 1816 in Habergy and died 21 January 1828 in Habergy and Maria Kettel born 19 May 1826 in Habergy and died 8 May 1827 in Habergy. Sgt. KETTLE was 32 when he enlisted at Cape Girardeau on August 15, 1862. He mustered in at Benton Barracks on September 18 as a Private in company F. He was Regimental Teamster until he was promoted to 5th Sgt. on June 20, 1863. He was captured on November 27, 1863 at the Battle of Ringgold Gap, GA. He died of pneumonia as a POW in Libby Prison, Richmond, VA. Please email me if you have comments, corrections, or more information. If you're studying the same topics, it's likely I have more information that you could use. I'm especially interested in old pictures. There are pictures of John and Nick Didier, but none of Mike so far.